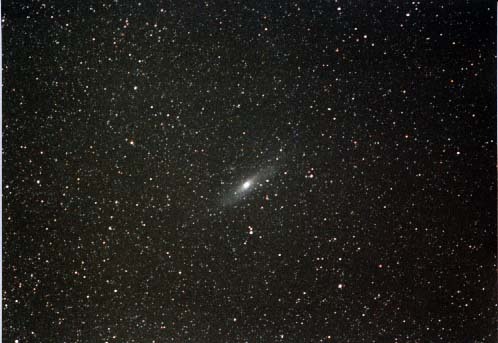 Picture a distant star in the Andromeda Galaxy two million lightyears away. This star shines brightly, as do countless others in this stellar pin-wheel. The star is pouring out tremendous energy in the form of visible light, infrared radiation, ultraviolet and many other flavors of the electromagnetic spectrum. It is also emitting material in the form of various particles, including the mysterious neutrino. A typical star. And yet one photon of this star's light is about to have a very non-typical journey. The story really begins at the center of the star where its nuclear engine is burning hydrogen, creating helium. One of the products of this process is visible light. Our photon is created here in this infernal region and begins its arduous journey toward the star's photosphere. The particle of light constantly bounces from one atom to the next, being absorbed and re-emitted uncounted times. Its path is serpentine in the extreme as it worms its way to the surface of the star. The temperature here is in the millions of degrees. Finally after what some astronomers believe are many years of this perpetual serpentine flight, a point is reached where the star-stuff or plasma becomes transparent and the photon flies away, along with trillions of others, leaving the relatively cool photosphere (only thousands of degrees now) far behind. Our intrepid traveler scuttles through Andromedan interstellar space in a mere few hundred years. During this time it makes few close calls to neighboring stars (and planets?). Some of its traveling companions are, however absorbed by nebular gas residing here. The only sign of these expiring quanta of light are a slight heating of this gas. As if passing a last signpost saying "No Gas for 100 Miles" it passes a lone globular cluster. This cluster's mass bends the path of the photon slightly as even light is affected this way. It passes this solitary globe of stars and proceeds into the emptiness of intergalactic space. While the particle speeds through this void, it travels in a straight line  almost. Even here it is affected by gravity. The Andromeda Galaxy is still exerting its influence, trying to pull our dab of light back toward its center. However, light never varies from its ever constant speed, at least in the vacuum of space. Even so, the conservation of energy must be maintained. So instead of losing velocity, the photon shifts color slightly toward red. You see, our particle is also a wave. This is a confusing idea. Its like water that is sometimes solid, sometimes liquid, a photon exhibits both the properties of a particle and a wave. According to general relativity its wavelength becomes longer as it climbs a gravity hill, while the path it takes is affected by the pull of gravity as it would if it were a particle. Another strange thing happens to our mote of light. As noted earlier it tries to travel in a straight line, but can't quite succeed. Stars affect its path, clusters and even galaxies pull it off its course. Stranger still is that even after these affects are taken into account, it still curves slightly! The mass of the entire universe affects its trajectory. Space itself is curved and our particle follows this curve. In the two million lightyears it travels in its life this curve is a subtle influence, but is real! Astronomers would very much like to know the exact shape of this curve: positive as on a sphere or negative as on a saddle-shaped surface. The photon knows, but isn't telling. During the time of this passing through the intergalactic deep, many things happen on our own small world. Several ice ages come and go. The rocky mountains grow taller. Strange animals flourish and become extinct. Yet after all this, our particle has still not reached its destination. Finally, man's civilization begins to reshape the planet. This time period  our time period  is the last one half of one percent of the entire journey. Our history is like a flash of fat in afire that has been burning for hours. Finally the photon enters the reaches of our milky-way galaxy. The gravity of our galactic home shifts the photon's color toward blue a small amount. Its path veers yet again toward the galactic center, but it doesn't make it that far  not even close. It enters an obscure arm of the starry spiral, falls in and is once again surrounded by stars. Fiery points pass by, but none are close enough to greatly affect it. It almost makes an uneventful trip right back out the other side of the galaxy. Instead, though, it encoun-ters a small, relativity dark body. In the last five seconds, if it could see, it would glimpse a small blue dot exploding into a sky-filling globe. The photon enters the Earth's atmosphere and it's path is bent alarmingly. This is not due to gravity, but refraction as the lens of our air slants its path before its final plummet to the nighttime country-side below. It penetrates the earth's envelope of gas in one one-thousandth of a second. Many of its co-travelers which have so far survived the journey end their existence hitting the ground, tree branches, and even the jacket of a lone telescopic observer. However our photon along with a handful of others falls right down the barrel of a waiting telescope. As it strikes the metal coating covering the glass parabolid that is the primary mirror, it is absorbed by an atom of aluminum. This atom on the surface of that very thin metal layer then ejects the particle and sends it back up the tube. It bounces off the secondary mirror and enters the eyepiece. Refraction once again takes hold and bends its path yet again as it passes through the first lens element. It flies through several such elements and crosses a small gap of air, finally entering the living lens of the observer's eye. In a time too small to measure it penetrates the cornea and lens of the eye. This lens is being very carefully shaped by a small muscle so that the photon along with its traveling companions are aimed by refraction to a common point on the waiting retina. Here our photon ends it existence. It impacts on a light sensor called a "rod". The photon expends its energy and causes a complex photochemical reaction. Signals are sent via nerves behind the retina to the brain. Even as this visual information is being sent to the observer's brain it is being processed. What is finally received by the visual cortex is not a signal that says "light" but one that roughly says "dim pin-point". This incredible chain of events is rather amazing as the signal has not yet even reached the brain itself. What happens there is even more amazing. All the pin-points are put together in the visual cortex and an image is formed of a distant softly-glowing pin-wheel. The Andromeda Galaxy is reconstructed in the observer's mind from bits of light that were borne in the belly of stars two million years ago! It is because of photons like this that amateur astronomy is a fun hobby. It is our minds and our understanding that make it a wonderful one. Day and night some photon or other arrives. Catch some!